Rennsteig can help you make your solar installs much more efficient, by giving you the tools you need to do a fast and professional job. 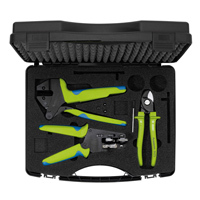 These precision cutting, stripping and crimping tools are specifically engineered for the wires and terminals specific to the solar industry. Our high-quality tools are designed for durability and efficiency, and give you consistently excellent results. 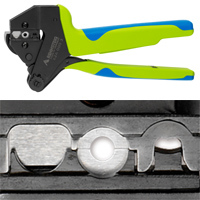 Rennsteig tools meet the requirements of EVERY professional user. 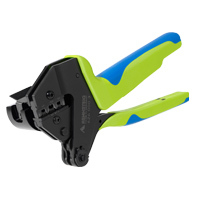 This crimp tool is recommended for crimping of Helios H4 machined contacts (Amphenol®), Tyco Solarlok®, MC4 (PV-SP4/6, PV-BP4/6, PV-SP4/8, PV-BP4/8) (Solarline 2) and other contacts available. Suitable for universal use for cutting and dismantling. Automatic reopening by spring-loaded handles. Easy and clean cutting by precision-ground blades. No crushing or deforming of the cut cable. 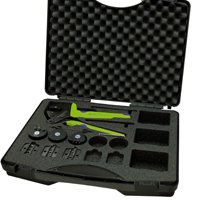 R62410540 — $901 (H4/MC4/Tyco) The Set includes: Solar system tool with H4 (machined) dies and locator (for AWG 14/12/10/8), Tyco (Solarlok®) die set and locator (for AWG 16/14/12/10), MC4 (Solarline 2) die set and locator (for AWG 14/12/10). R62410551 — $655 (H4/MC4) The Set includes: Solar system tool with MC4 die set and locator (for 12/10 AWG (stamped&formed) and 8 AWG (solid)), Amphenol H4 (machined contact) die set and locator (for AWG 14/12/10/8). 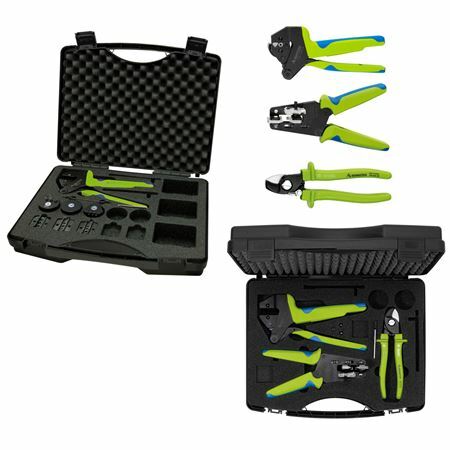 R62410532 — $1045 (H4/MC4/Tyco) The Kit includes: Insulation stripper for solar wire (AWG 16/14/12/10), Cable cutter (Max. wire cross-section: 50 mm2), Solar system tool with Tyco (Solarlok®) dies and locator (for AWG 16/14/12/10), MC4 (Solarline 2) die set and locator (for AWG 14/12/10), Amphenol H4 (machined contact) die set and locator (for AWG 14/12/10/8). R62410552 — $815 (H4/MC4) The Kit includes: Insulation stripper for solar wire (AWG 16/14/12/10), Cable cutter (Max. wire cross-section: 50 mm2), Solar system tool with MC4 die set and locator (for 12/10 AWG (stamped&formed) and 8 AWG (solid)), Amphenol H4 (machined contact) die set and locator (for AWG 14/12/10/8). No more carrying around 3 different tools, when all you really want to do is make a connection. Unique in the industry!